Last month, legendary cueist 33-year-old Pankaj Advani increased the number of his world titles to 21 after he won both the long and short formats of the IBSF World Billiards Championship titles for a record fourth time. A recipient of the Arjuna Award, Rajiv Gandhi Khel Ratna, Padma Shri and the Padma Bhushan, Advani stands tall amongst India’s galaxy of sportspersons. And in the changing world where news is digested most swiftly in the virtual world, he is reportedly the most followed cueist on social media, across Twitter, Instagram and Facebook. Yet, in a country that follows cricket and now football and badminton with more than a keen degree of interest, Advani’s feats do not get the spotlight they deserve. Soon after his victory last month, Verve catches up with him…. A world title tally of 21! Is the excitement as keen as when you won your first one? What does success mean to you, after so many wins? Every victory is special to me because the path I take to reach the pinnacle is different. The taste of victory does get sweeter and by now I have developed a pretty sweet tooth. Success for me is not a destination. It can’t be a terminus which I want to reach. Every tournament I participate in, I play with the single objective of winning. Do you experience a sense of hurt at the fact that the game – and you – does not largely get its due recognition in a country where fans are obsessed with other games? It is up to the media to highlight the achievements of champion athletes. I do my job to the best of my ability. It is not in my birthright to be recognised in a country where dynamics and news are constantly changing. I do believe though that anyone who brings glory to India must be valued and appreciated. Since you are by and large playing the same players at different tourneys, does that make winning easier or more difficult? It is a bit of both. You know what to expect but there are many who want to defeat you and take your position. I must be constantly on my toes and keep improving and growing as an athlete to remain ahead of the curve. Before every match, I visualise myself playing the game in complete flow and harmony. Visualisation is an effective tool to have in your arsenal. It helps me settle down quickly in the arena. Power naps always help too. I normally eat light before a match as I don’t want to sleep on the table! How important are mind-games or planned gameplay in billiards? What most people don’t realise is how strenuous the long formats of billiards can be. It is pure endurance and the ability to keep one’s focus, observing your opponent’s move and then trying to outsmart them is not as easy as it looks. It is very important to remain in the zone and always have your eye on the prize. Sighting the ball is extremely important in cue sports. How do you ensure physical and mental readiness on the day of a tourney? Through meditation and visualisation, although it can’t be something I can totally rely as each shot can be a different variant. However, it helps me prepare for every possible scenario that might occur in a match. There have been moments where I have been almost down and out in a match, but managed to fight my way back and win the match. In between shots, what goes through your mind? There is a lot of strategy that goes into cue sports. Before I play a shot, I think of where I would like the ball to be placed for my next shot and so on and so forth. It is about being one step ahead of your opponent. What is the camaraderie on the circuit? Oh, it is amazing. We all compete hard on the table but remain good friends off the table.It is truly a gentleman’s game. I have made some great friends from different countries like Qatar, Australia and the England. To take you back in time, what drew you to the world of coloured balls? My brother, Shree. He used to go and play and one day I decided to join him. Who knew it would lead to all of this! Not me, for sure, back in the day. I just went to watch him play. Apart from actual play, what are the challenges that you face while playing in different lands? Being a vegetarian! When you’re on the road for four to six weeks in a row, you just miss the simple things in life like dal and roti. There are places where the only vegetarian item on a menu is French fries. Its not something I can have daily. How have you managed to juggle the worlds of snooker and billiards so effortlessly – the skillsets called for are not the same? Billiards and snooker are two entirely different sports played on the same table. Major contrast in terms of technique, approach, scoring patterns and rhythm. Normally, cueists specialise only in one sport, but it is the challenge of doing something no one has done before that keeps me going! So, I now call myself a specialist in two sports! I have found a way to change my technique from one to the other as and when required. It is a like a switch that I can turn on and off at an instance. I love the different challenges both games throw at me and that is why I have been successful in juggling between both these sports. What would you say is your core strength as a player? It would have to be intensity. I think my mind and body seem to have understood (on most occasions) the need to raise my game especially in a big match like the finals of a major international championship. I call it the ability to switch gears to reach the next level! Credit must go to my older brother Shree is a sports psychologist and has really helped me up the mental aspect of my game over the last 10 years. He has taught me how to focus on the process instead of worrying about the result, to enjoy the competitiveness instead of dreading it. My mom calls me a pressure cooker because I cook (perform) well under pressure! What keeps you going, after having almost achieved it all? Roger Federer. Cause he is the greatest of all time. What he is doing at his age is unimaginable and the way he goes about it without breaking a sweat. It’s poetry in motion. He is a champion in every sense of the word. He is humble, classy, focused and gracious in victory and defeat – the perfect role model for an athlete. What would you say is the future of cue sports in our country, especially if you look at the participation of women? There are many opportunities for the men, but it is unfortunate that the women do not have many tournaments. The PSUs have been recruiting top players making it easier for us to play our game and not worry about the future. Television coverage is essential to improving the popularity and increasing awareness. What makes you maintain such a low profile? I let my performance to do the talking, not my mouth! I am a major fan of the Batman franchise. In the first film, Batman says, “It is not who you are underneath, but what you do that defines you.” Let your success make the noise is my motto. 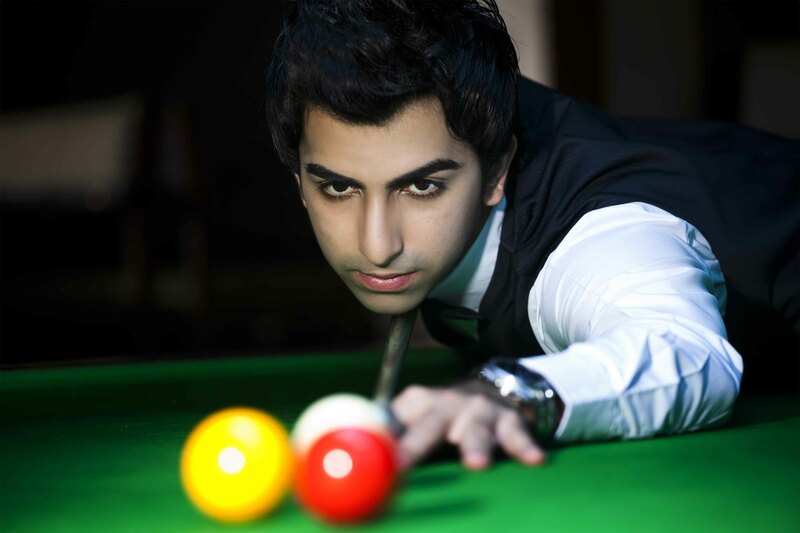 How do you react to the comment that you are the poster boy for cue sports in India? What would you tell youngsters who would like to take up the sport? Enjoy the game, keep learning, don’t go after name, fame and rewards, they are all a by-product of success.